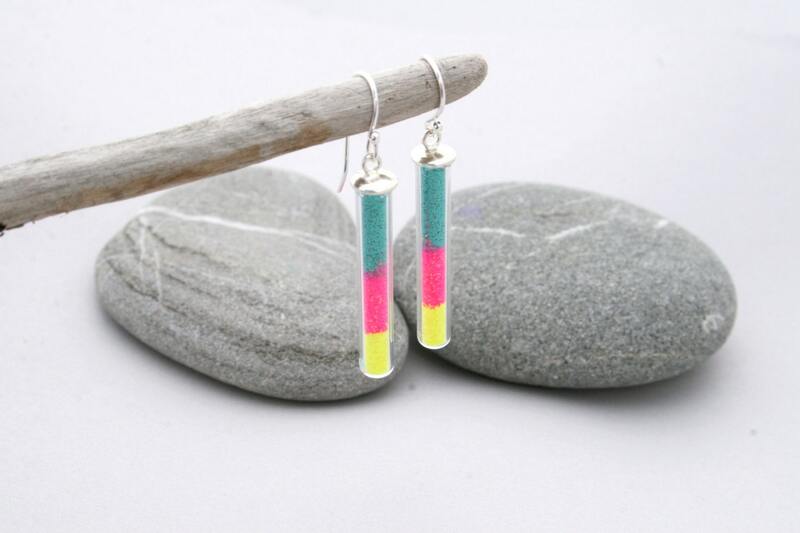 These beautiful teal, pink and yellow neon earrings have a slight sparkle in the neon glitter, they are so bright and fun they would make great summer earrings! They are layers of neon glitter in small glass tubes. I packed the glitter down tight so they won't get shaken up and mixed together. Silver plated tops are glued to the top of the tubes and they are suspended from silver plated earring wires. Each earring, top to bottom, measures about 2 inches. Interested in something that will make more of a statement? Looking for different glitter colors/layers? Do you want one of these as a necklace? Don't see exactly what you are looking for? Click the "Request Custom Order" button to the left and let me know what I can make especially for you or a loved one. I'd be happy to work with you to customize a piece to your preferences! I have masses of glitter to make anything you are looking for because I also make nail polish.